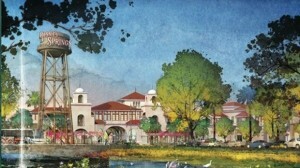 As Disney tradition goes, the area will have a back story reflecting turn-of-the-century Florida. The idea is that the town grew up around a spring. You will be able to see the evolution in the environment as the town has grown and changed. This spring is what will connect the neighborhoods along the waterfront. Disney Springs will offer a wide variety of entertainment for the whole family. The littlest guests will enjoy a ride on the carousel or mini train, while parents will enjoy all the live music available at the restaurants and on the Waterside Stage. Many Walt Disney World visitors like to plan a day to explore here or even just come for the evening after the theme parks have closed. 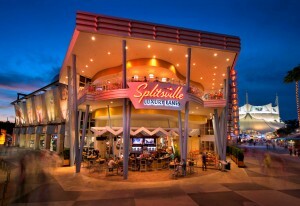 An afternoon at Splitsville Luxory Lanes can be a fun way to pass the time or enjoy dinner and a show at the “Fork & Screen” movie theaters. Cirque du Soleil’s La Nouba is perfect for a night out. Recently I had the opportunity to spend some time at Disney Springs. It was still going by the name of Downtown Disney at the time, but, I could already feel the vibe changing to Disney Springs. And, it is pretty exciting! Most of The Landing is now open, and enhancements have been made to the Marketplace and West Side, the Town Center and second parking garage is expected to be completed by summer 2016. 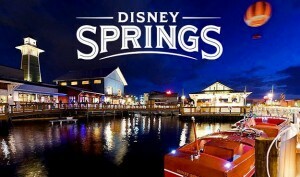 I’m going to tell you about each of the Disney Springs neighborhoods in a series of articles. But, let’s start the first thing EVERYONE asks about a visit to Disney Springs. How is the parking? On our September visit, the roads leading to the parking area were crowded, as usual. And much of what used to be the general parking lot was blocked off for use as handicapped parking only. 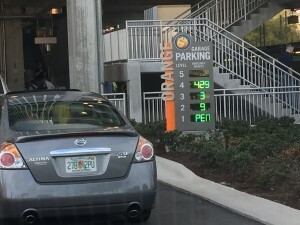 So we were funneled toward … (cue music, spotlights and pixie dust here) … the all-new, five-level Disney Springs parking garage. And there was much to love about it. For starters, it’s free. Yes, you read that right. Free parking. Currently, the Westbound ramp from I-4 into the Orange Garage is now open. The ramp will take cars directly into the parking area, with a choice of the garage or the lot behind Cirque du Soleil. We parked in both areas on our two separate visits in September. Both are at the far west end of Disney Springs. In true Disney fashion, this is no ordinary parking garage. The best part of this much needed parking garage is the technology. Super cool! Like, wave of the future cool! The floor entrance and each parking aisle has a small electronic screen that has a number on it. That screen is telling us how many spaces are available in that specific aisle. Over top of each parking spot is a scanner. It detects if there is a car in the space. When a car pulls into the space, the little green light turns red and one number is deducted from the row counter and subsequently the floor counter at the end of the aisle. This allows the driver to know how many parking spaces on a floor, and even more detailed, in an aisle before they turn into it. This technology will virtually eliminate driving from floor to floor, row after row looking for a space. As you look beyond your car to other aisles, you can see the red and green scanning lights over each parking space. Well played Disney! Once you are parked, there are elevators AND escalators to move pedestrian traffic from floor to floor. And of course, there are Disney Cast Members to help guide you through the structure. The new flyover ramp into the Orange parking garage is now open. If you are headed east toward Hotel Plaza Blvd., stay in the right lane to use the ramp, which leads directly into Level 3 of the parking garage. To exit the garage onto Buena Vista Drive, you will use the intersection across from Team Disney or by using the ramp on Level 2. To reach the Marketplace, use the Team Disney pedestrian bridge or the Hotel Plaza Blvd. crosswalk. Valet parking is available at West Side from 2:30pm-2:00am. Pricing is based on length of stay – time starts when you reach the valet podium and stops when you return to the podium to pick up your car. You will pay when you leave. Guests with Tables in Wonderland will receive complimentary valet parking with a valid dining receipt (except for the following blackout dates: Easter, Mother’s Day, 4th of July, Thanksgiving, Christmas Eve, Christmas Day, New Year’s Eve and New Year’s Day, and any special events at Downtown Disney). Guests will find electronic directional signage along Buena Vista Drive marking the best places to park. If you are staying at a Disney Resort hotel, you are encouraged to use the complimentary bus and water transportation to Disney Springs. From Disney’s Saratoga Springs Resort & Spa, a pedestrian bridge lets you walk directly to Disney Springs Marketplace. Boat transportation is offered daily from 10:30am-11:30pm, every 20 minutes. 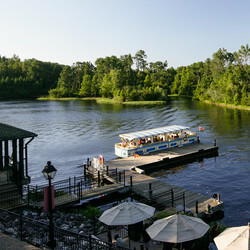 Yellow route – Sassagoula River Cruise goes to and from Port Orleans French Quarter and Riverside from the Marketplace Dock. Green route – services the West Side to and from Old Key West. Red route – water taxi stops at the West Side Dock and Marketplace dock. This route operates daily from 9:00am – 1:30am. The last guest pick-up of the day will be 1:30am. If you are unsure of how to navigate the Walt Disney World Resort, check out our very own OLP WDW Transportation Wizard or our WDW Transportation Wizard Ap for your cell phone. TWiz puts the fun in functionality! Simply pick a starting location (where you are) and then pick the place you want to get to. Mr. Wizard will promptly make fun suggestions about how to get there using transportation. Mr. Wizard also estimates how long it will take to get there. Talk about super cool technology! We’ve got it too! 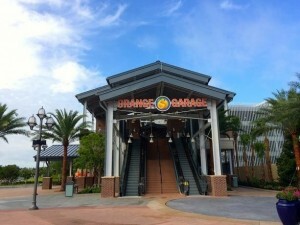 So, now that you have been properly introduced to Disney Springs and know the ins and outs of parking and getting there, please come on back and see what’s new. If you think I’m excited about a parking garage…wait until I show you the neighborhood!